How Could Access Help You? Looking to boost your bottom line? What do 10 million members from over 300 client organizations look like? See below for just a few of the predominant consumer segments from select organizations we serve. Couples and families who work hard so they can play hard, take regular, more expensive vacations and dine out more frequently. Sophisticated tastes and active lifestyles. College educated, young, hip and stylish technophiles focused on fun, with ready access to cash/credit – be it their own or their parents’. Heavy internet users and consumers of music/electronics. Highly connected through social networks. Consumers who prefer to hire out basic everyday services and have the means and disposable income to do so. Tend to value convenience, personal safety and leisure time. Working class to upper-middle income individuals with children and/or grandchildren, maintaining active social and extended family networks, increasingly tech-savvy and living primarily in the suburbs. World-changing idealists motivated more by “making a difference” and work-life balance than high salaries and pursuit of wealth. Fashion-aware and tech-savvy, yet proud and price-conscious deal seekers. Middle to upper-class individuals with good investing habits who value financial freedom and economic independence. Always interested in opportunities to save a buck but not at the expense of value. And More… The Access client lineup also includes such demographically diverse groups as loyalty programs, media publishers, and small business owners – just to name a few. And with a database that extends beyond millions of opt-in email addresses, we can help make sure you reach them. 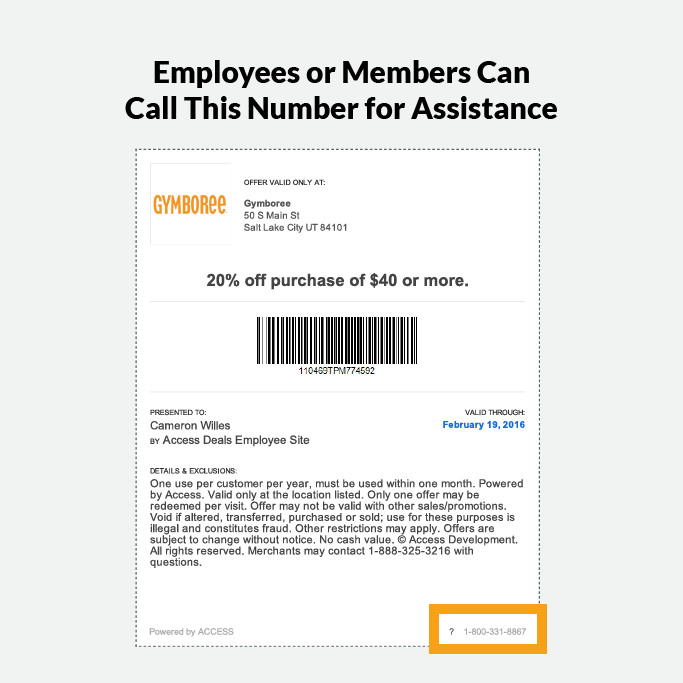 Member users must log in to the password-protected Access benefits site before they can view your offer, click your links, or print your coupons. So your offer is NOT public facing. 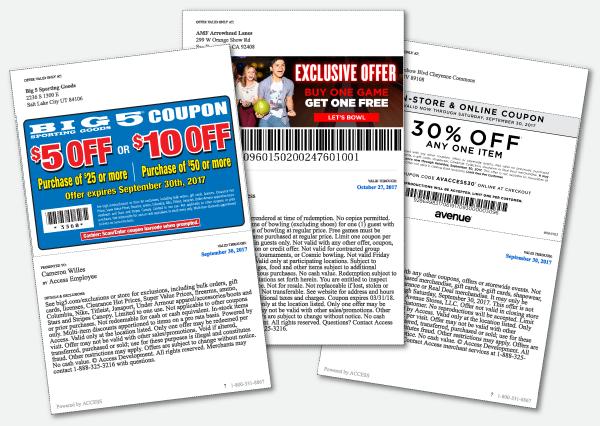 Plus, all coupons have extra security measures in place, like expiration dates, member names, etc. (see the next page for more details). 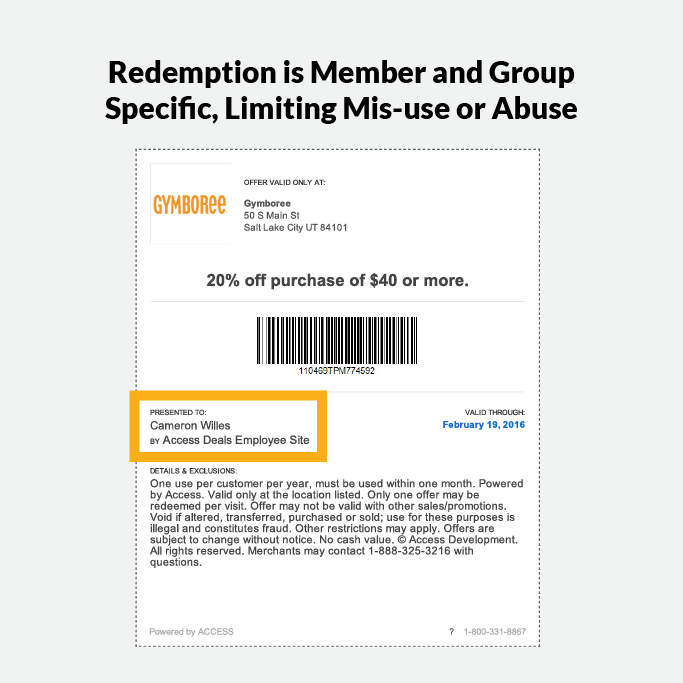 Organizations participate in Access programs to gain member loyalty. They encourage members to frequent the program as often as possible. Also, since the deals are positioned as an exclusive benefit from a trusted organization, members welcome our marketing efforts as an opportunity to stay informed on the newest and best deals. 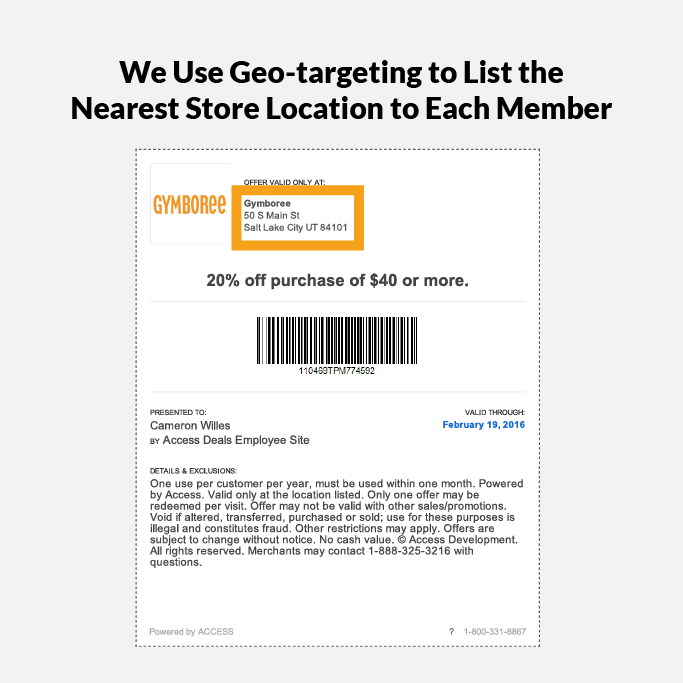 Every location gets its own dedicated page which will appear when nearby members search their city or ZIP Code for deals. 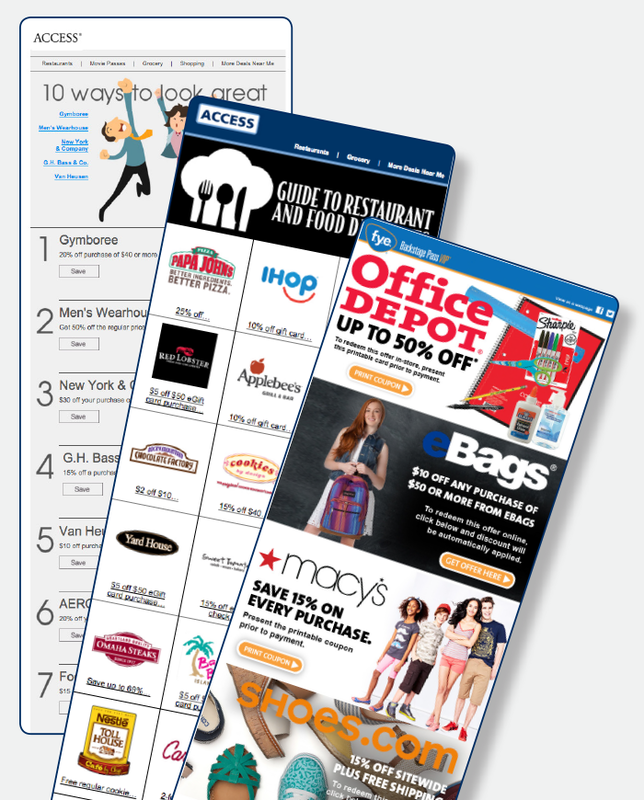 To make your advertising even more targeted, you also have the ability to customize every page with a host of options. We offer regular analytics, detailing – views, redemption clicks, etc. After 30+ years, we know how to drive customers your way by crafting smart, compelling promotional offers. 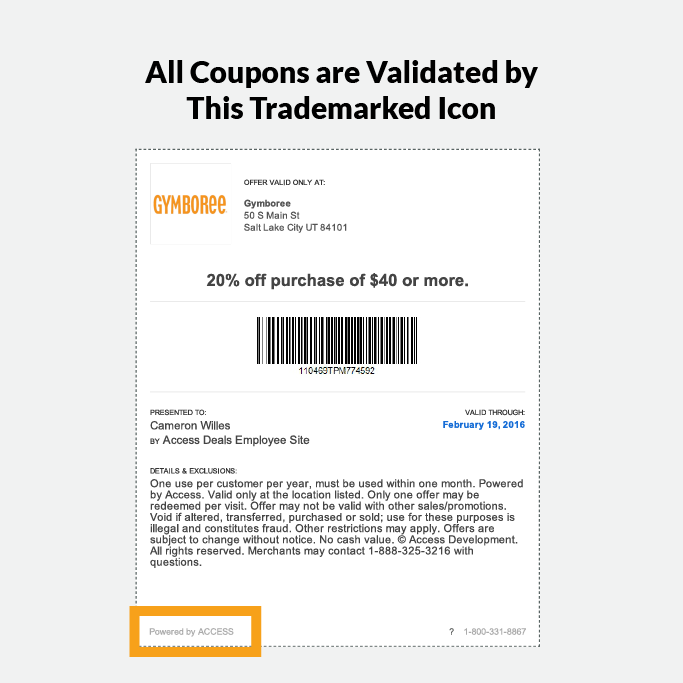 We can change offers/barcodes/coupon codes, custom coupons, and URLs upon request. You can also pause regular offers and replace with a spurt promotion or short-term, more assertive offer. Brands with best results generally provide year-round offers. 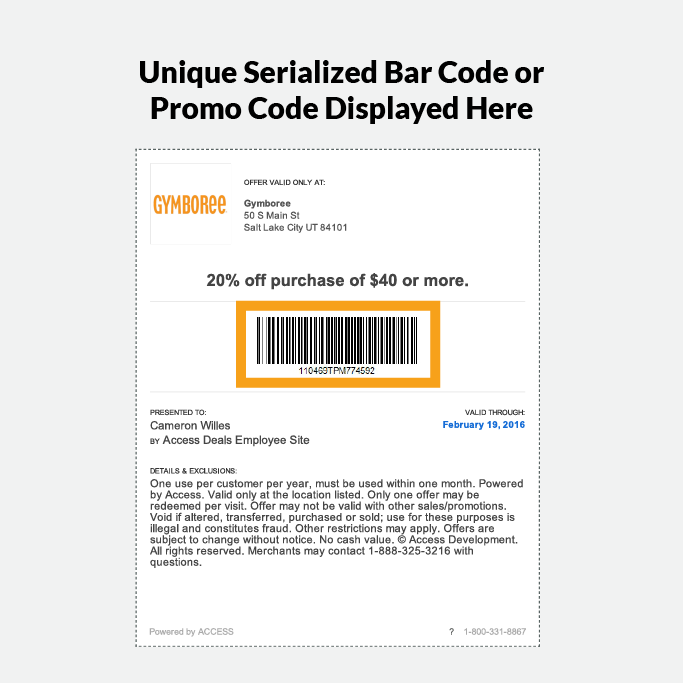 We offer serialized or unique promotional bar codes that allow your organization to control redemption down to the individual coupon, and reduce unauthorized redemptions. 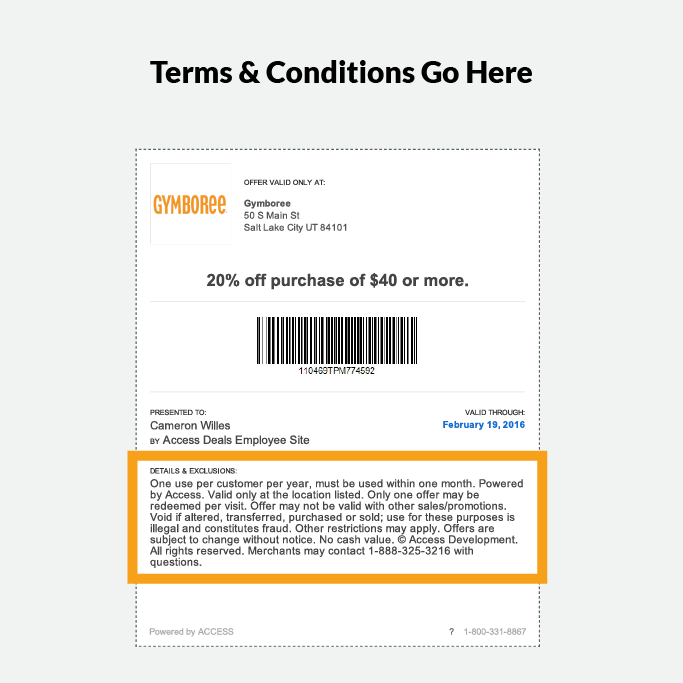 You can choose to limit how often members redeem your coupon (once per month, quarter, year, etc.). OR allow for multiple printing if you want our members to visit your locations more frequently. 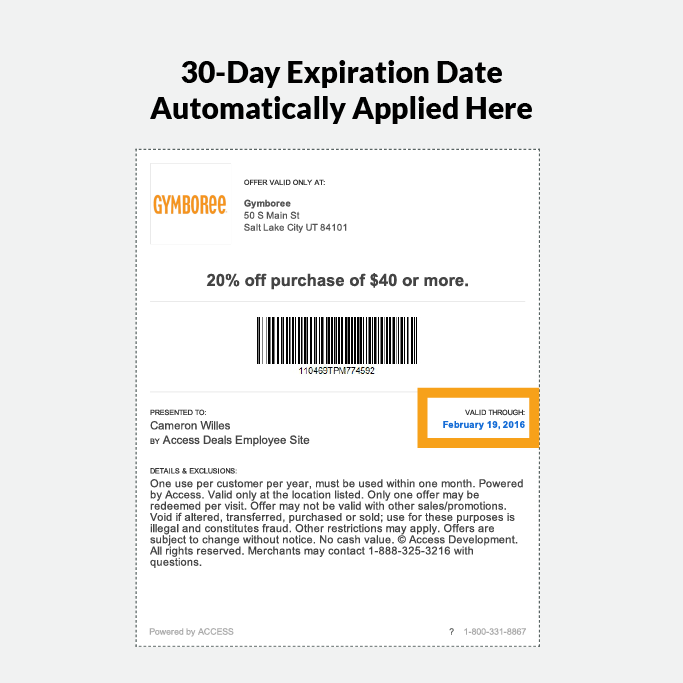 Our system automatically puts a 30-day expiration window on each coupon once it is printed, OR you can specify any expiration date of your choosing. You may send an eCoupon layout already formatted as an EPS, PDF or JPG file from your in-house creative, or use the Access Certificate coupon layout/artwork (see images for examples of both). 85% of working adults own a smartphone, but the members who use our popular mobile app are tech-savvy, on-the-go, highly educated and ready to spend. The Access mobile app can help you speak directly to this demographic in a relevant, meaningful way. What can Access mobile do for you? Plus, with the Access mobile application, it’s easy to train your employees to recognize the Access program. 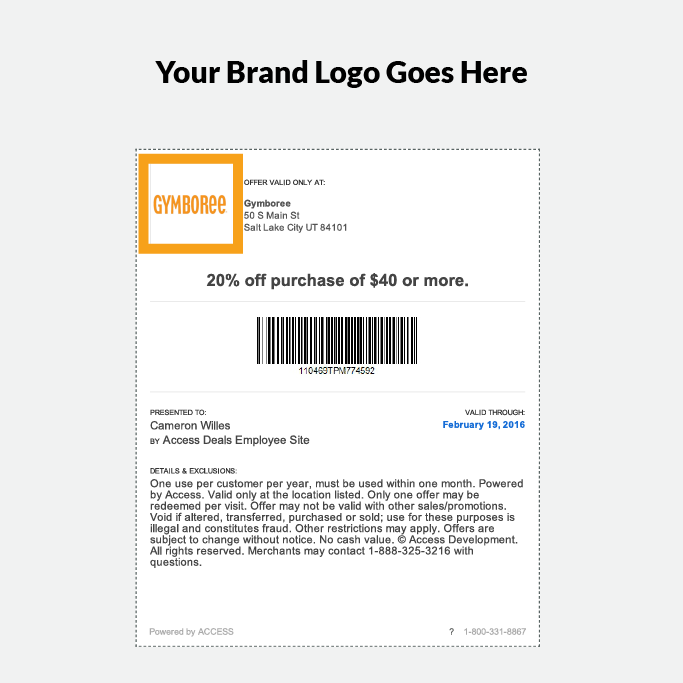 They simply look for the “Powered by Access” logo, which appears on all of our mobile coupon offers. Keeps members engaged. Keeps Your Business in the spotlight. Client branding gives our emails preferred status among customers, increasing recognition, response and offer redemption. Local content automatically features merchants in the recipient’s neighborhood, so the most relevant offers reach the most relevant customers. Seasonal themes match top merchants with peak spend periods to ensure we’re featuring the most seasonally relevant offers (or spurt promotions) when customers are already thinking about buying. Merchant spotlights link directly to the offer where customers can easily redeem your deal. We send 4-6 million emails per month (3x a month to up to 2 million email addresses). All email addresses are opted in by member or the organization on whose behalf we are sending. We partner with the industry leader of email send technology, which helps us maintain 99% deliverability, sophisticated design and CAN-SPAM compliance. Generally, our members are educated adults with higher disposable income. They live in all 50 states and come from diverse backgrounds. 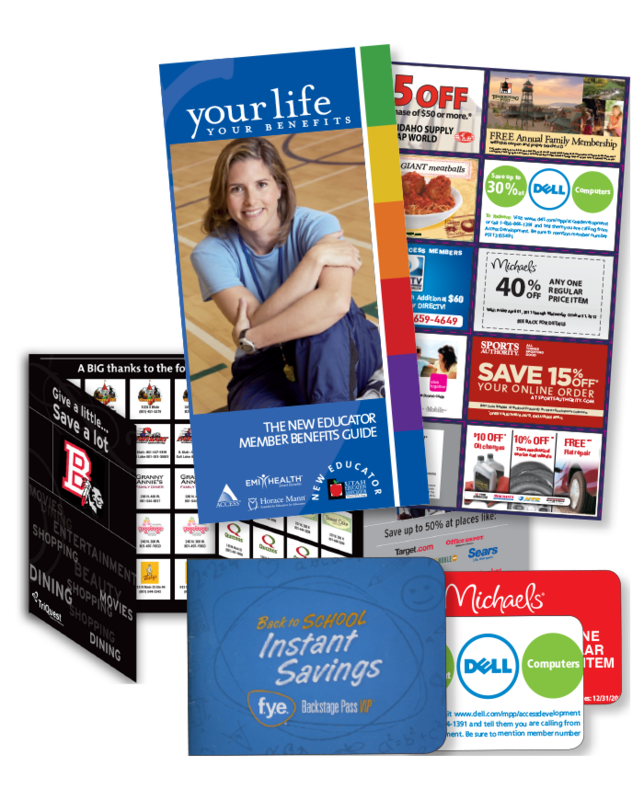 Throughout the year, our client organizations execute print promotions that are designed to prominently feature select merchants. Our promotions collectively enjoy millions of impressions per year, so when opportunities arise, we make sure to contact the best-fitting brands. Organization-funded — You pay nothing to be featured. Targeted — Brands are hand-picked based on known group preferences and buying habits. Diverse — Promotional opportunities consist of virtually every marketing channel imaginable. Opportunities include statement inserts, newsletters, coupon books, fundraising cards and many more. See below for a few examples. Your account manager will work with you to structure your promotion and, if needed, design your offer creative. Alternately, some clients design their own to match their corporate branding guidelines. Either way, we’ll seek your approval on every print piece featuring your brand.